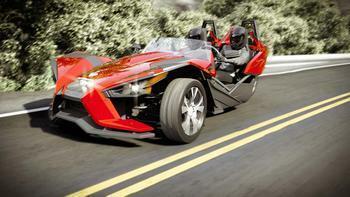 Polaris Industries is recalling 11,371 model year 2015-2016 Polaris Slingshot, Slingshot SL and Slingshot SL LE motorcycles equipped with a backup camera. The back-up camera may fail internally, possibly melting the voltage regulator and blowing the fuse for that circuit, thereby preventing the taillight from functioning properly. The melted voltage regulator can increase the risk of a fire. The loss of a tail light can increase the risk of a crash. Polaris will notify owners, and dealers will inspect and replace the back-up camera, as necessary, free of charge. The recall is expected to begin December 6, 2018. Owners may contact Polaris at 1-855-863-2284. Polaris' number for this recall is T-18-04.